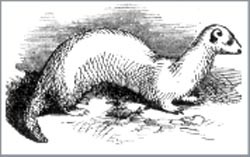 HISTORY: The history of the ferret and ferreting. No one knows exactly when the ferret was first domesticated, though archeological remains of the ferret have been dated to 1500 BCE. Most estimates place it sometime around the domestication of the cat. Some say the ancient Egyptians had ferrets, but it is more likely that Europeans visiting Egypt saw cats, and thought using a small carnivore to protect grain stores was a great idea. The ferret was probably bred from the European Polecat (Mustela putorius), and some use the scientific name Mustela putorius furo. It is also possible that ferrets have the Steppe polecat (Mustela eversmanni) in their ancestry. For hundreds of years the main use of ferrets was for hunting, called ferreting. With their long, lean build and aggressive nature, they are very well equipped for getting down holes and chasing rabbits or other vermin out of their burrows. They are still used for hunting in some countries, including the United Kingdom and, particularly, Australia, where rabbits are a plague species and, despite the availability of a great deal of modern technology, the combination of a few small nets and a ferret or two remains very effective. In countries such as Portugal, where it's feared this activity could unbalance the ecology, ferreting has been made illegal. It uses material from the Wikipedia article "Ferret"